This heifer our best 2014 heifer and she is fancy and should mature into awesome cow, she was bred for twisty horn genetics. Her sire is out of a twisty cow and her dam is a twisty cow. She started to brindle at around 5 months old. 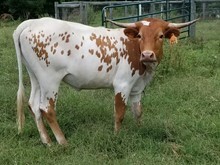 She is bred to carry on the twist genetics in our herd. Had a heifer calf by Cozmology in 2017, She had a bull by JTW Oh Mys Bandera Boy for 2018, and exposed to LAR Rain Maker and Tuff and Ready for a 2019. 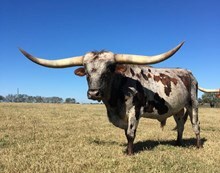 SOLD at the 2019 Cattle Barons Sale, with the 2018 bull calf at side.